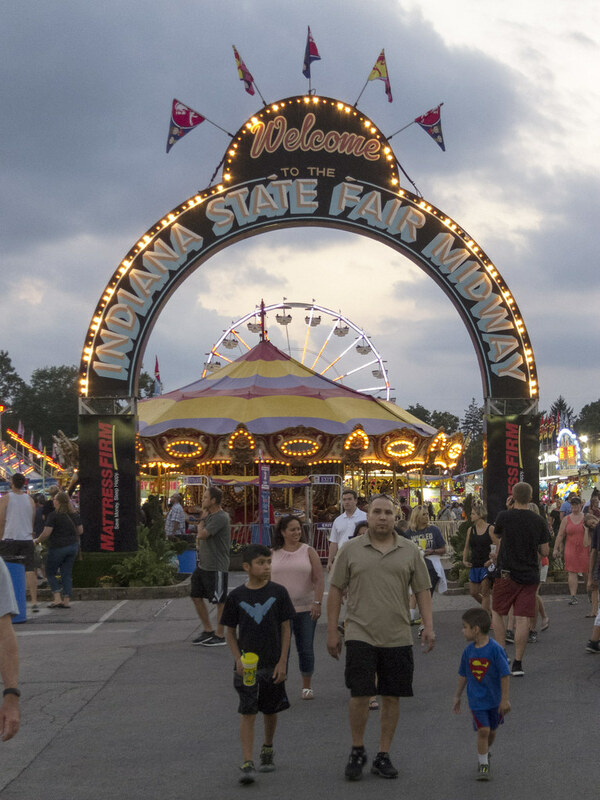 It’s become personal tradition that I go to the Indiana State Fair at least once when it comes around, which this year is August 4-20. 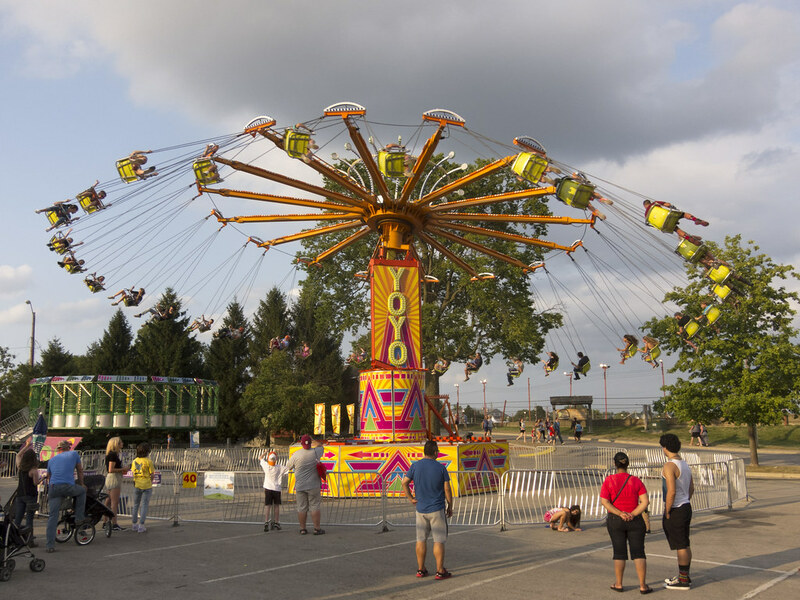 New this year is the Skyride, which spans 1,400 feet across the fairgrounds’ front promenade. While it’s cool, the reconfiguring necessary to accommodate it cut out a lot of pedestrian space. It was crowded. I’d rather have the old configuration back. But the Skyride didn’t take away any space from the food booths. All the usual vendors are back. My favorite two foods at the Indiana State Fair are the smoked turkey legs and the Indiana ice cream from the ice-cream barn. Oh my, the turkey legs are outstanding. Dairy doesn’t sit as well on my stomach as it used to, so I forewent the ice cream this visit. Frowny face. 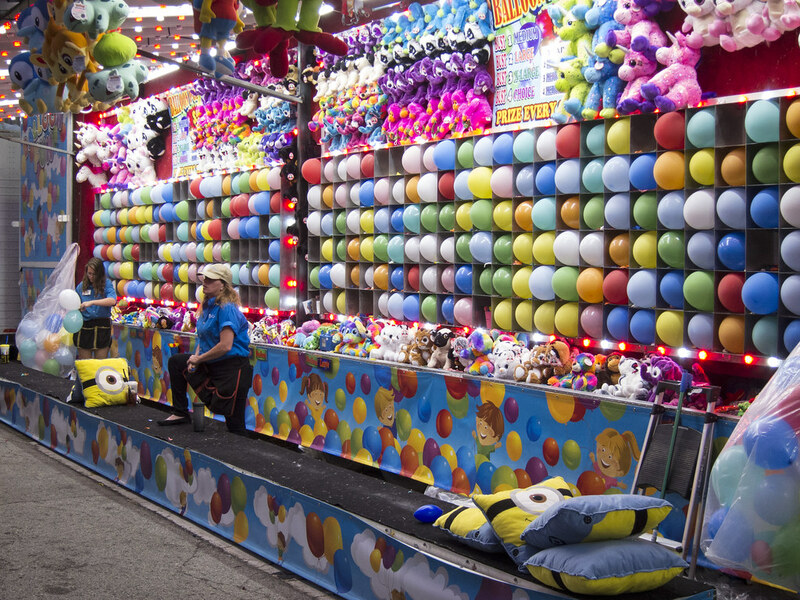 I like photographing the midway the most. There’s so much to focus on, and it is challenging to capture the moving rides at just the right moment to make interesting photographs. I am pleased I got that fellow with his arms out like that, and the young woman looking like she was calling out to someone. We went to the fair after work and stayed until darkness fell. At dusk, the lights go on. Dusk is my favorite time at the fair. The hot sun has gone away and the lights are on, yet there’s enough natural light to see well. The games seem even more colorful at dusk than they do in daylight. 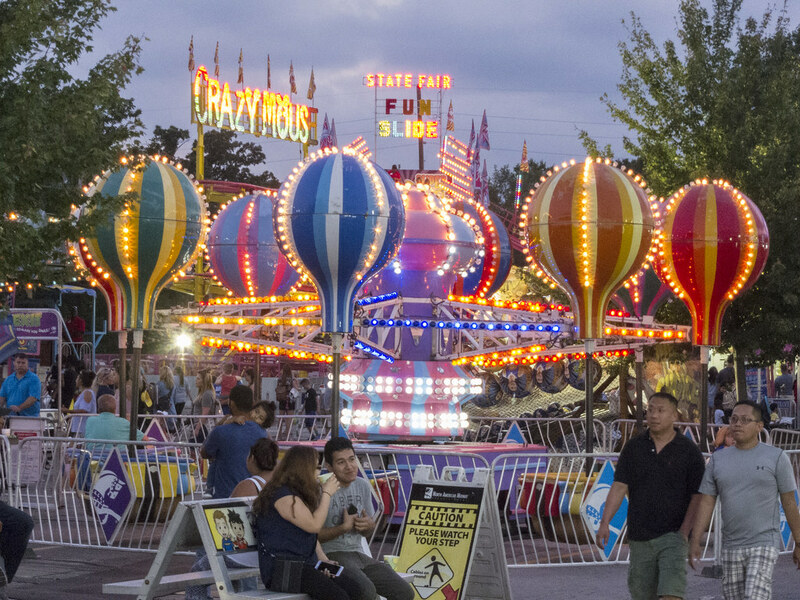 The midway is just at its most photogenic when it is lit. 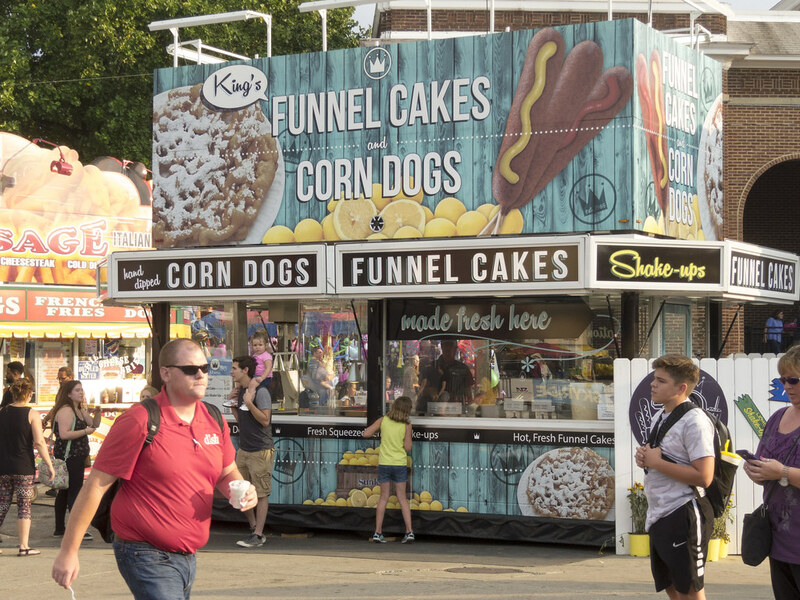 I like to get people in the foreground of my fair-scene photographs, especially when they’re doing something interesting. I was super pleased that three Indiana State Police officers wandered into my shot as I was composing, and that my Canon S95’s shutter lag was not so bad that I couldn’t keep them in the frame. Where night falls slowly in July, it falls quickly in August. All of a sudden, it was dark. 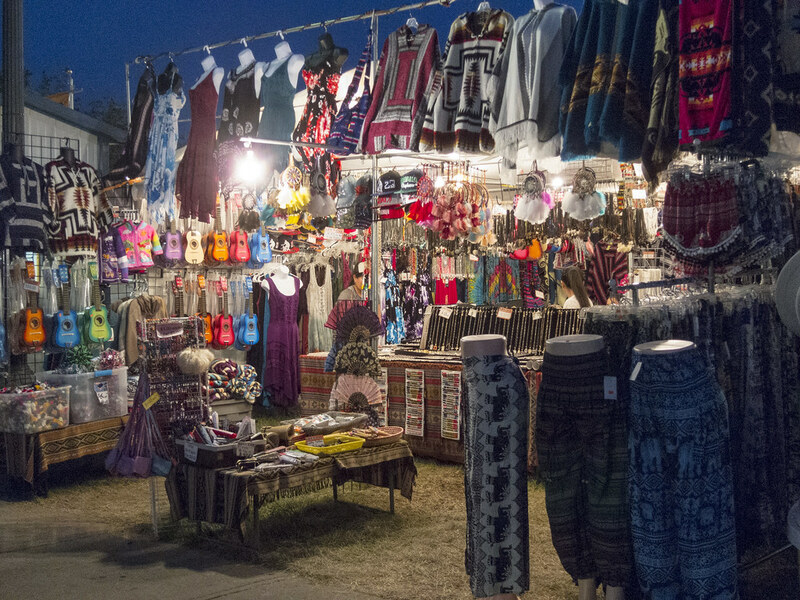 We came out of the midway and walked the back half of the fairgrounds, where booths are set up with all sorts of things for sale, from hundred thousand dollar farm tractors to ten dollar pendants. By this time we were tired. I bought my traditional giant bag of kettle corn, and a box of taffy for my youngest son, and we headed home. 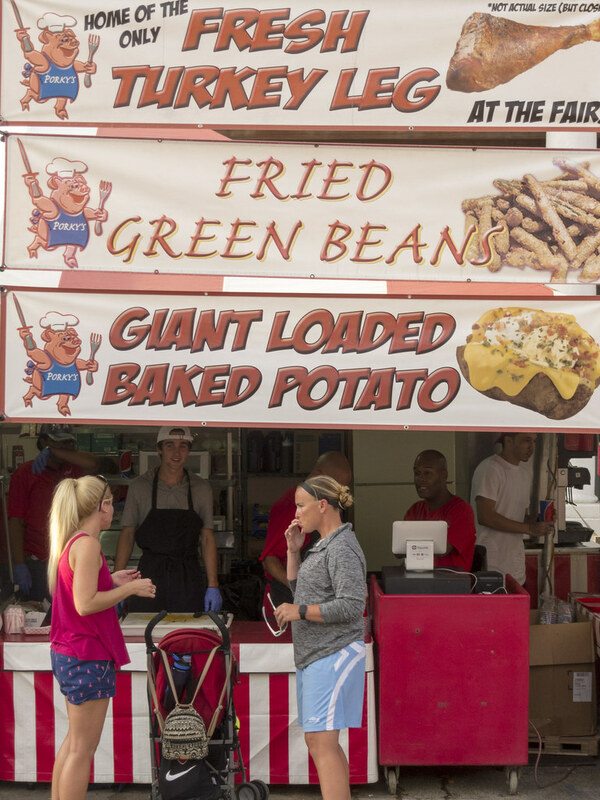 As usual, your Fair pictures are some of my favorites. What a fun post! After my Mom left Lancaster Drive with my sisters and me, we moved to Scottsdale and lived on Renfrew Drive. Our backyard faced Jackson Road, so we had a bird’s eye view of the week-long County Fair each year. These photos bring back memories of those sights, sounds and smells, so thank you for sharing. One of my funniest memories is the “carnies” going door to door looking for free beer at the end of Fair Week when they were breaking down the rides! Was it really only a week? Gosh, seems like it ran longer than that! But then, it wasn’t just off my back yard. And those carnies had chutzpah to knock on doors asking for beer! 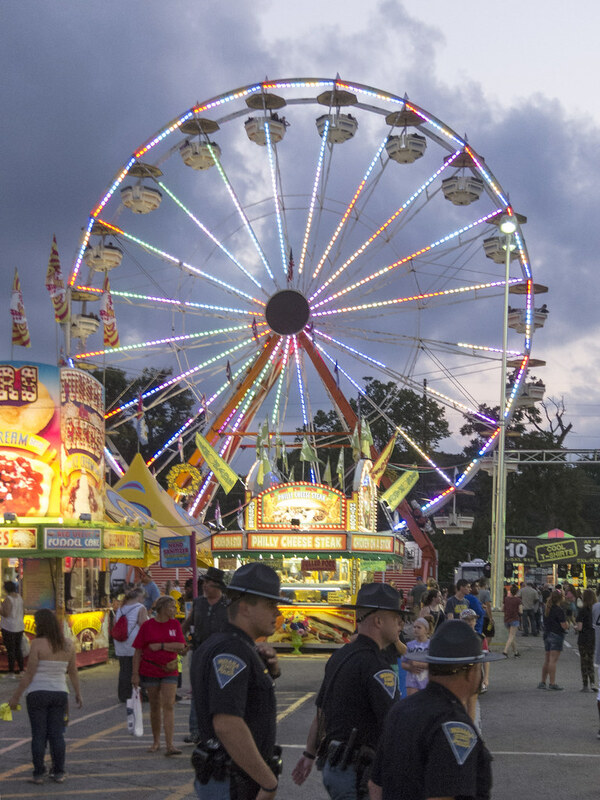 That’s a fine picture story that makes the county fair look like a lot of fun. I liked them as a kid, mostly for the cotton candy I think. As I grew into adulthood I developed an aversion to crowds which got in the way of enjoying the event. Oddly enough, one of the best jobs I ever had was being the maintenance man at the Elmore County Fairgrounds in Glenns Ferry, Idaho. I was by myself outdoors most of the time. My boss, the county extension agent, drove down from Mountain Home for a visit about once a month to pat me on the back, and sometimes we went bird hunting in the hills north of town. I mostly moved irrigation lines during the Summer, interspersed with driving the old Farmall tractor around the grounds. In the Winter I did some rough carpentry and painted the buildings and grandstands. I actually avoided going to the Fair, partly because I objected to the way the animals were treated in the rodeo. The pay for the Fairgrounds job was about as low as the expectations for what I should be doing during the day. I had to supplement my county income by bucking hay in the Fall and hunting coyotes in the Winter. I finally gave up the Fairgrounds to go work at the commercial trout farms up river near Twin Falls. Mike, I’m delighted you shared these memories. It sounds like you’ve led a very interesting life! I would enjoy reading more stories, perhaps triggered by photographs you take, shared on your blog. One of the best jobs I ever had was as a courier. I was issued a company vehicle and sent all over northern Indiana and southwest Michigan delivering papers and small boxes, mostly to industrial clients. I was alone 90% of the time, just me and the road and the AM radio in the dash. As I drove, I’d listen to WLS, which still played top-40 music then. This was before cell phones and constant connectivity — once I was sent, I was unreachable until I returned. I felt a sense of freedom in that job I’ve tried to recapture since with little luck. 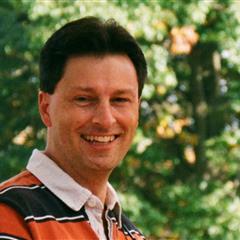 There was little future in the courier business and I have no regrets shifting into my software-development career, but my day to day does not ever involve the feeling of freedom I had as a courier. I, too, have developed an aversion to crowds. It sounds like my aversion isn’t as strong as yours. But an event has to be pretty valuable or enjoyable to me before I will suffer a large crowd. Arena concerts are a particular problem. I can count on one hand the bands that mean enough to me to get me into an arena to see them. A refreshing consequence has been that I’ve become more willing to see some up and coming bands in smaller venues where the crowds are smaller. 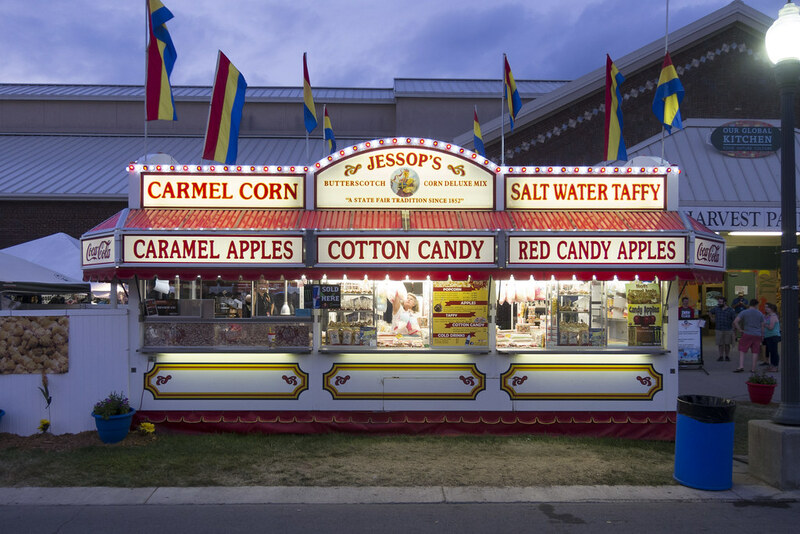 We absolutely love state fairs, festivals, and the like! Your pics make us want to take a road trip and see this one — and eat there, too! 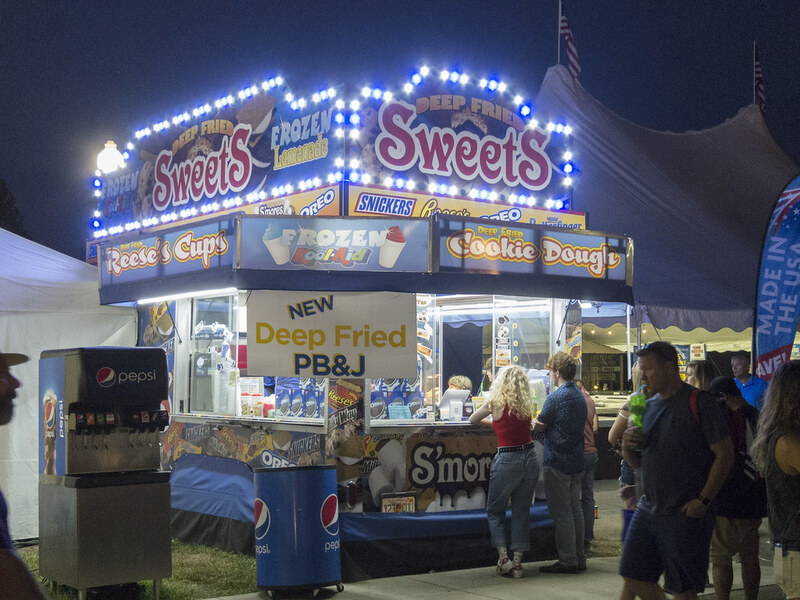 Your State Fair looks eerily similar to ours — right down to the Skyride (same name), Crazy Mouse ride (same name), and Deep Fried Sweets (same terrible idea). And like you I’m also increasingly becoming intolerant of crowds … and yet I continue to uphold my tradition of going at least once a year. How fun it is to see this parallel reality through your eyes, Jim. 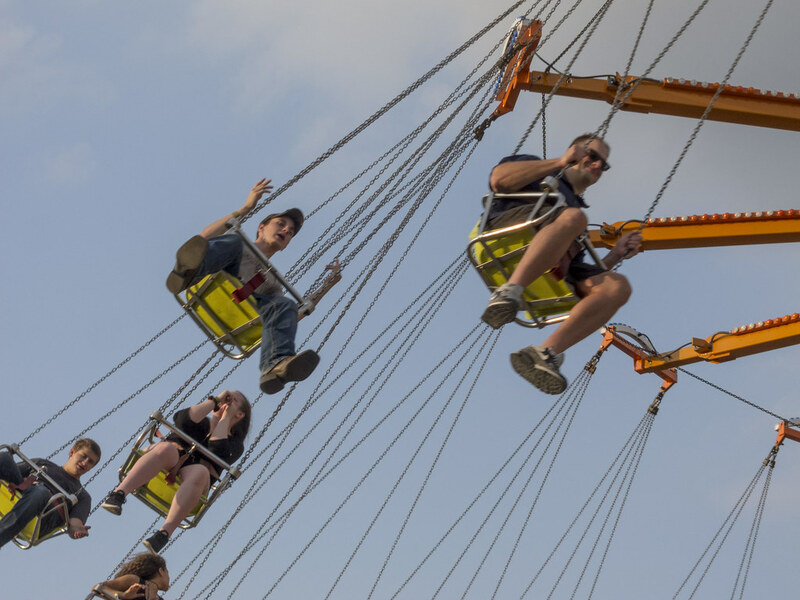 Someone I follow on Instagram has been posting pics from the Orange County, CA, fair and it looks like the Indiana fair, too, right down to the Skyride! 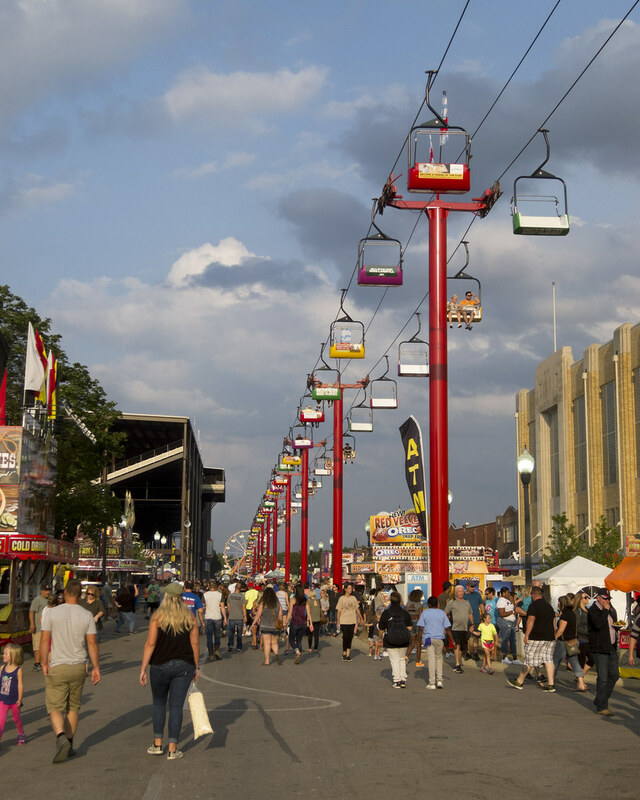 Whoever sells Skyrides is having a very good year. You continue to provide me with the ability to enjoy the fair, if only vicariously. It is funny that the guy who has lived maybe 3 miles from the State Fairgrounds for nearly 25 years has been there a total of two times. It’s a pleasant thing to do, to walk around and look at the people and the exhibits, and to have some bad-for-you food. I recommend it! I think I have mentioned that my Mrs. (who grew up across the street from the fairgrounds) is still suffering from Fair Fatigue. Now I really want an elephant ear! No elephant ears for me — I’m gluten free! So I double down on protein, which is abundant!